and other vacancies. The place of posting under DMHO Hospitals of Vizianagaram. The total no of vacancies can be filled through DMHO recruitment are 29 posts. Applications can be downloaded from the Vizianagaram official website @ www.vizianagaram.nic.in. Eligible and Qualified candidates with the age limit of 40 years (For Dental Hygienist is 36 years), can apply for these vacancies using the DMHO website before 22-12-2018 The documents should send along with DMHO Vizianagaram Recruitment applications are given in the notification. Recruitment of Pharmacists, Specialist, Dental Hygienist, Civil Assistant Surgeon and other vacancies selection will be made through qualifying Examination conducted by DMHO Authority. 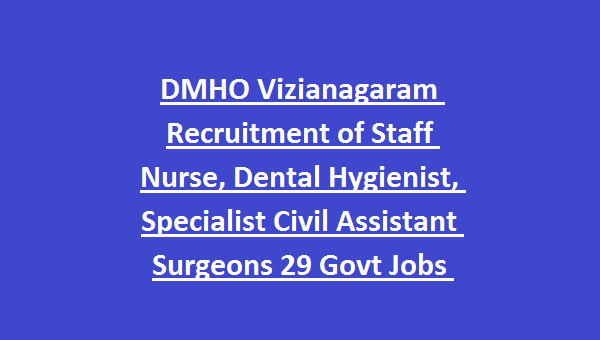 Details of District Medical and Health Office DMHO Vizianagaram Staff Nurse Recruitment Qualifications, age limits, Selection method, Application process are obtained from DMHO Vizianagaram website. 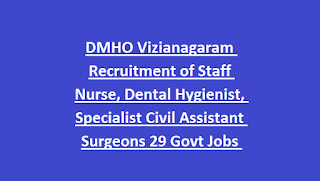 There are total 29 posts in this DMHO Vizianagaram Recruitment. Qualifications required for these DMHO vacancies is MBBS Degree/ General Nursing/ Diploma/ Intermediate in relevant discipline from recognized board/ institution/ university. Post wise qualifications information can be obtained from DMHO notification. Please follow the DMHO Notification for post wise salary information. For DMHO vacancies of Staff Nurse, Physiotherapist, Rehabilitation Worker maximum age limit should be 40 years as on 01-12-2018. For all other posts upper age limit is 50 years. Relaxations for SC/ ST/ BC candidates is 05 years and Physically Handicapped candidates is 03 years. DMHO Recruitment of Staff Nurse, Specialists, Pharmacists and other jobs selection is based on marks in qualifying examination. Please go through the DMHO notification for more updates. Initially a provision list will be displayed after receiving the applications. Final merit list will be displayed on 22-12-2018 based marks and reservations. Qualified candidates submit their applications with the documents mentioned in the website through DMHO Vizianagaram website www.vizianagaram.nic.in before last date. Last date for submission of applications is 22-12-2018. Total No of Vacancies: 40 posts. 1. Staff Nurse: 05 posts. 2. Counselor (RMNCH): 01 post. 3. Dental Hygienist (NOHP): 09 posts. 4. ANM Sub centers: 06 posts. 5. Finance & Logistical Consultant NVBDCP: 01 post. 6. Sr. Medical Officer: 01 post. 7. Sr. Treatment Supervisor: 02 posts. 8. Specialists (OB & GY) CEMONC: 02 posts. 9. Staff Nurse CEMONC: 02 posts. 10. Specialists (Pead) FRUs: 03 posts. 11. O.T Technician FRUs: 02 posts. 12. Ophthalmic Surgeon NPCB: 01 post. 13. Civil Assistant Surgeon: 01 post. 14. Pharmacist Gr.II: 04 posts.